I know there is a roll of honour inside the school hall. There is also an obelisk that is under repair somewhere. I have a feeling that there were also boards inside the girls school too. However the girls school, Queen Mary, is now a private development. The school took the very brave move of combining the two schools about 10 years ago and now they run as a single school. The web address is here. Very informative. However I got the opportunity to photograph the sundial outside the school. It is in good condition and sited to the left of the main entrance. Here are the pictures. "IN MEMORY OF AN OLD BOY KILLED 26TH JUNE 1918"
Inside the school is some additional information that relates to this memorial. 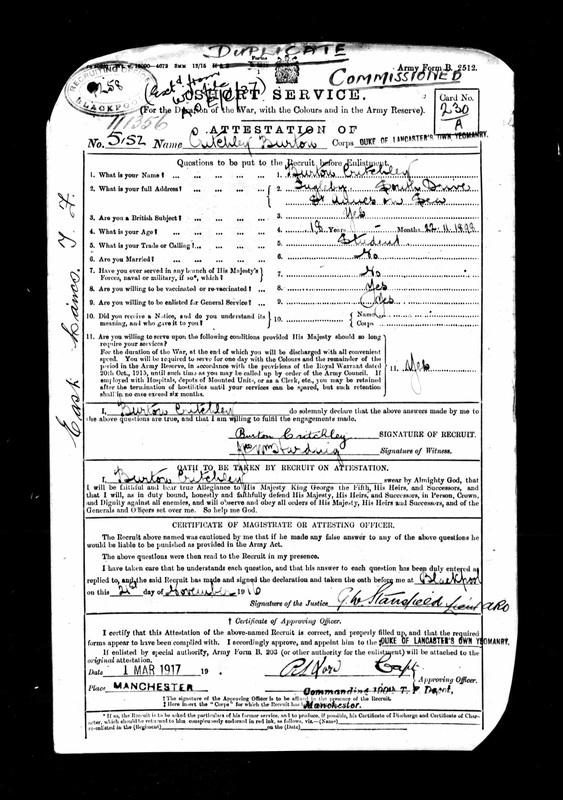 It seems that it relates to a former pupil called 2nd Lieutenant Burton "Plum" Critchley. He was the son of Charles Frederick and Martha Critchley, of St. Annes-on-Sea, Lancs. He is also commemorated at the Pernes Cemetery. He was in the Airforce at the time. 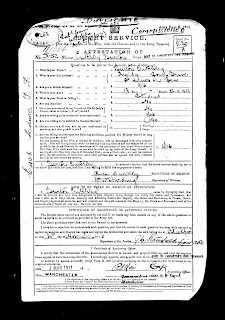 This is a copy of Burton Critchley's sign-up papers. He was commissioned into the Duke of Lancaster's Own Yeomanry. This is the drive that extends from Clifton drive to the front of the school. The sundial is to the left of the picture. An update: Visited the school during an Open Day and spoke to the Bursar. He has responsibility for the heritage of what is now AKS. I was carrying a minimum of equipment around that night. However he is allowing me to photograph the memorials inside the school. So watch this space!